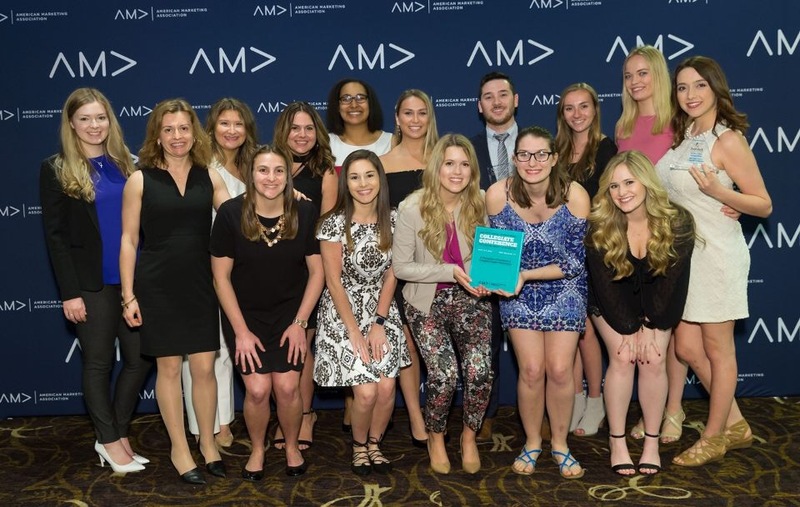 The SJFC AMA serves to provide students with real life marketing experience, networking, and resume building opportunities through collaboration with the American Marketing Association, local marketing professionals, and the St. John Fisher College School of Business faculty and staff. The SJFC AMA became a recognized collegiate chapter of the AMA in 2010 with only 7 student members. Today, we are over 30 members strong and we expect to keep growing. Although we are a smaller chapter, our size allows us to form strong relationships, allowing an environment conducive for effective communication and collaboration. St. John Fisher College is located in Western New York, nestled between the suburbs and city streets of Rochester. The Victor E. Salerno Center for American Enterprise opened in September 2013, complete with a trading room, LED ticker with real-time financial data, classrooms equipped with interactive technology and more. It is home to over 800 School of Business students, including our very own SJFC AMA members. So get a jump-start on your career – start developing your professional business writing and communication skills now, so you can apply them to a real-world environment after graduation. By becoming a member of the AMA, you will have exclusive access to valuable resources for job hunting, making connections with industry professionals, as well as the latest news and research related to marketing. Check out this year's E-Board! The SJFC AMA Sales Division formed in 2017, as a result of SJFC AMA members attending multiple sales competitions the prior year. 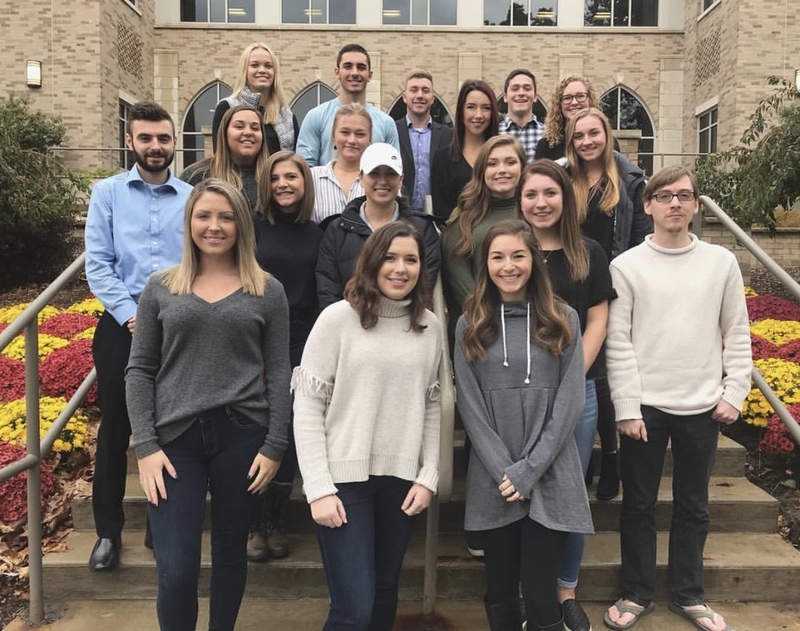 With an increased emphasis on the importance of sales skills post-graduation and a strong interest from School of Business students, the Sales Division was another step in creating opportunities for SJFC Students to learn and grow. The Sales Division holds official meetings twice a month to enhance sales skills, prepare for upcoming competitions and network with local sales professionals and peers. Beyond those two monthly meetings, students get together on their own time to practice for both on-site and off-site competitions including Perfect Pitches (Elevator Pitch) and Sales Role-Plays. In 2016, AMA members were able to attend 3 offsite-competitions and 1 competition over the phone. With the increasing membership and interest from the School of Business, this number is expected to grow. To learn more about the Sales Division, contact Megan Yeaple at mwy00882@sjfc.edu. The American Marketing Association (AMA) is one of the largest professional associations for marketers with over 30,000 members worldwide in every area of marketing. The SJFC AMA Collegiate Chapter is a registered affiliate of the AMA and works closely with Rochester's AMA chapter throughout the year. SJFC AMA members attend conferences and networking events sponsored by the Rochester AMA including the Four A's, Super Bowl Ad Review, Social Media Speed Dating, and the Rochester Collegiate Conference. Marketing Association, area businesses, and the St. John Fisher College School of Business. Dr. Monica Hodis, Associate Professor of Marketing, founded the SJFCAMA chapter in 2010 and has been the academic advisor ever since. Dr. Hodis is a passionate teacher, relentless AMA supporter, and active researcher. She currently teaches Personal Selling and International Marketing, and occasionally Marketing Principles. In her classes she focuses on active engagement and helping students build essential skills, such as critical thinking, collaboration, and communication. 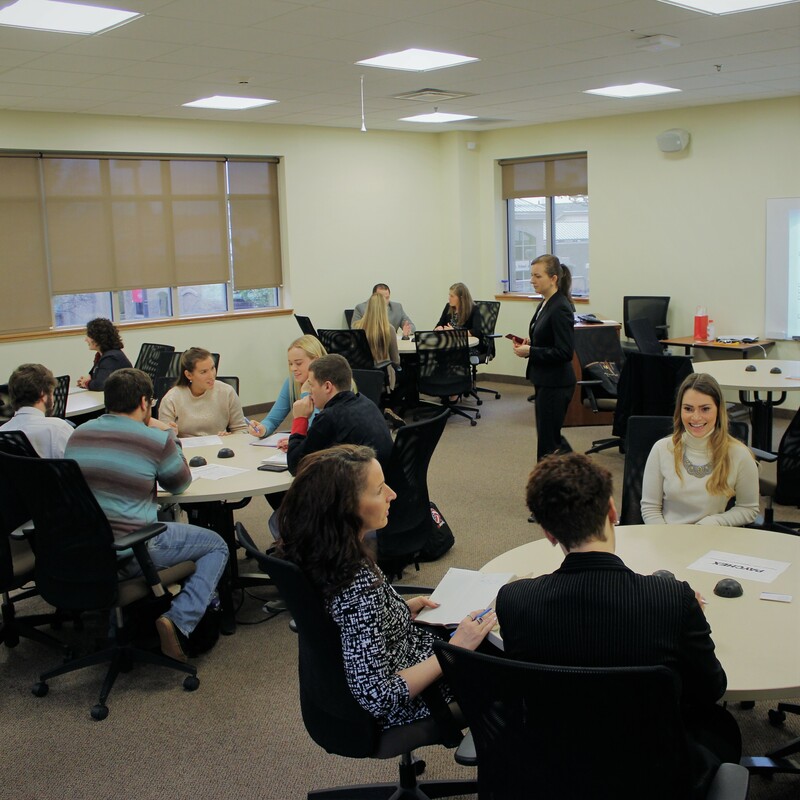 Dr. Hodis participates in the service-learning program at Fisher by requiring students in Marketing Principles to write and present comprehensive marketing plans for local businesses in need. Her research is in the areas of digital marketing, online consumer behavior, and branding. Dr. Hodis’ current focus is social media marketing. Two of her studies on social media are listed as Harvard Business Review cases. Her work has been presented at top national and international marketing conferences and published in major academic journals such as the Journal of the Academy of Marketing Science (2014 Best Article Award), Journal of International Management, Journal of Marketing Management, MIT Sloan Management Review, and Business Horizons. Over the past 6 years we have won several awards on different professional levels. These recognized accomplishments have allowed us to establish a credible reputation as a student organization in our campus community. We have had greater interest in our club, higher committee attendance, and more students have come to events we have hosted. Our winning has attracted funding from local businesses and marketing firms in the Rochester area to sponsor our efforts and support our chapter’s success. As a face of the St. John Fisher School of Business, we have a lot to be proud of. Winning in the past motivates us to improve ourselves each year and to continue the legacy we have started. Outstanding Marketing Week Activities – Third year in a row, for their week-long series of speakers, workshops and events in early October 2013. Outstanding Marketing Week Activities – for their week-long series of speakers, workshops and events in early October 2012. Outstanding Marketing Week Activities – for their week-long series of speakers, workshops and events in early October 2011. AMA Saves Lives competition. AMA Saves Lives was an AMA national initiative that was sponsored by Donate Life and ended last year. It sought to be a catalyst for increasing awareness of the need for organ donation and through social media campaigns, event sponsorship, personal contacts, and other viral communications to inspire others to become registered organ donors and organ donor advocates. SJFC AMA, with the help of students from my Fall 2010 section of MGMT221, submitted four videos to the national AMA competition, promoted those videos online, and won two awards and $200. It should be noted that our Fisher students were competing against colleges and universities from across the country, many of them much larger schools such as the Ohio State University, University of Arizona Tucson, University of Wisconsin, Texas State University. In today’s ever-changing environment,technology and social media, specifically Facebook, Twitter, Instagram, and LinkedIn are playing an increasingly pivotal role in society—in fact,1 in 4 people around the world engage in social media, and by 2017 the number of users is expected to surpass 2.5 billion (eMarketer). In today’s society dominated by technology, social media serves a prominent (and consuming) role. Employers both past and present, friends, family, etc. all have access into your life and because of this it’s crucial to have proper social media etiquette—your personal and profession self will thank you. Ever wonder why people seem different online compared to in person? Could social media be impacting the way we communicate with others? It is almost like we have created a second personality. It took me sitting in on a Digital Disruption Panel to really think about about why. Millennials – taking the industry by storm with their fancy gadgets, flashy clothes and a fresh-out-of-college attitude. This is usually what comes to mind when most people think of the newest generation of workers…but why?